After living in London for quite some time I've learnt keep some from of water-repellent outerwear in my wardrobe at all times. Since I haven't been able to find the trench coat of my dreams – not one I can afford, anyway – I thought a waxed jacket is the best option. 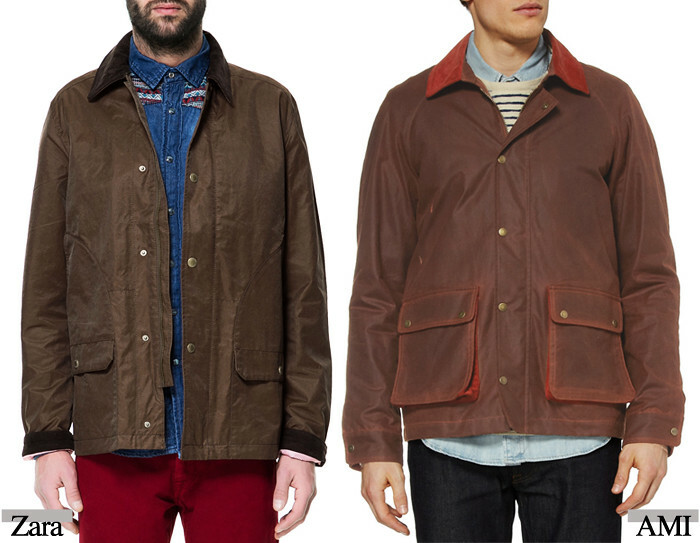 I found these two Barbour-inspired models a while back and have been debating which one to get for a while. Eventually, I went for the Zara option, which arrived on the post today and looks much better in person. I ended up choosing it over the AMI jacket because the overall fit is more flattering and modern – with no bulging side pockets – and because it's got a bunch of very useful inside pockets I simply can't live without. However, I love the reddish tile finish of the AMI one, it's understated but it makes the jacket feel less common. Both feature collar and inside cuff corduroy details, which I love but I love the red micro check lining on the sleeves on the Zara jacket.